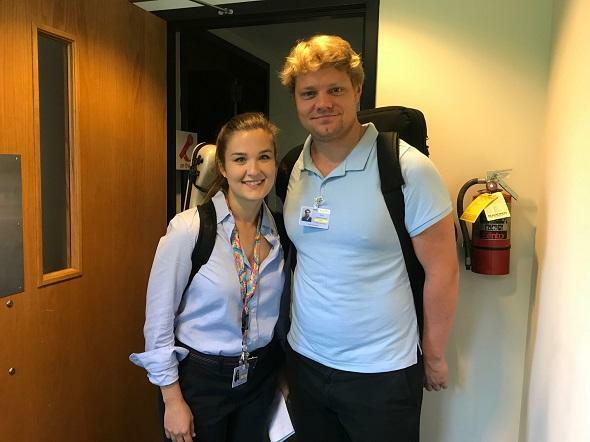 Violinist Celeste Golden-Boyer of the Saint Louis Symphony Orchestra and violinist David Coucheron of the Atlanta Symphony Orchestra are Valade teaching fellows at Interlochen Center for the Arts this summer. They joined us in Interlochen Public Radio's Studio A to talk about their careers, their work with the Interlochen students and experiences from their own student days. Coucheron and Golden-Boyer played music of Charles-August de Bériot. Hear their performance and conversation with IPR's Nancy Deneen below. Violin Duo by Charles-August de Bériot performed by David Coucheron and Celeste Golden-Boyer in IPR's Studio A.
David Coucheron's and Celeste Golden-Boyer's residencies at Interlochen are supported by the Valade Fellows Teaching Endowment.